So I made yet another cabinet. I used it Saturday on steel with a country band and it sounded great. I'll use it on jazz bass next weekend with a piano trio. It's my Travis Toy TT-12 in a 12" dia. x 13" high concrete form tube. It weighs about 12 lbs. It's closed back, there's no cabinet vibration because it's a cylinder, and I aim it at the ceiling with an adjustable reflector so it's almost omnidirectional (not beamey) and the indirect sound takes the edge off the mids a bit. 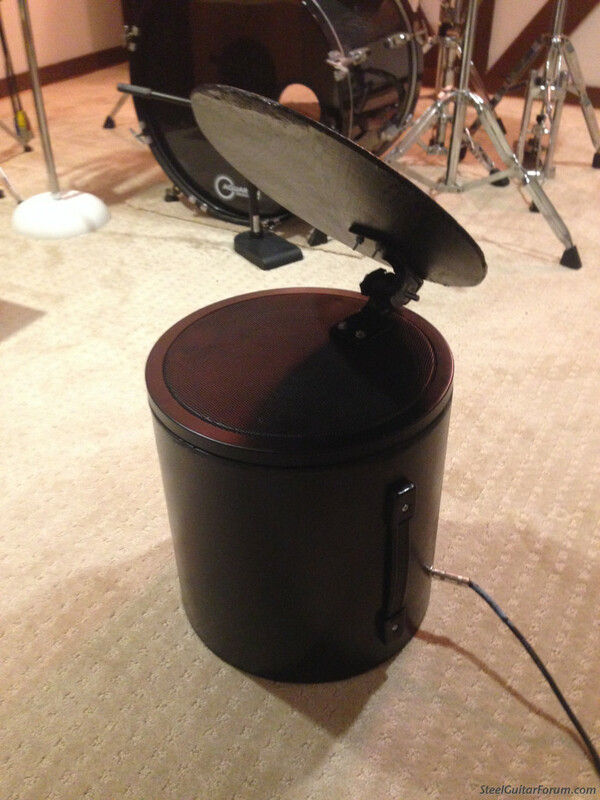 The best part was that the drummer thought the sound guy was micing a wastebasket. Hope nobody mistakes it for a porta potty, Glenn. How about standing waves /resonance frequencies? I have a thick cardboard divider inside running vertically to cut the cylinder into 2 "half-pipes" to break up the horizontal modes. Because of the speaker cone and the fact that the pipe dia is about the same, there are no parallel surfaces in the vertical direction except for the narrow speaker mounting ring. The volume is stuffed with long fiber wool. The volume looks small, but it's actually tuned for max flat according to TS, and the stuffing moves the tuning in the lower q direction. I saw this design years ago in Speaker Builder magazine. Their cab had a down firing speaker, and a cone on top to distribute the sound 360 degrees, (it was also intended for bass). I never got around to building one, thanks for the post! I'm with you on the cabinet construction, but I don't understand what that hinged disc sticking up is.I assume it's a pressure zone mic of some sort. Looks like the top of a trash can. 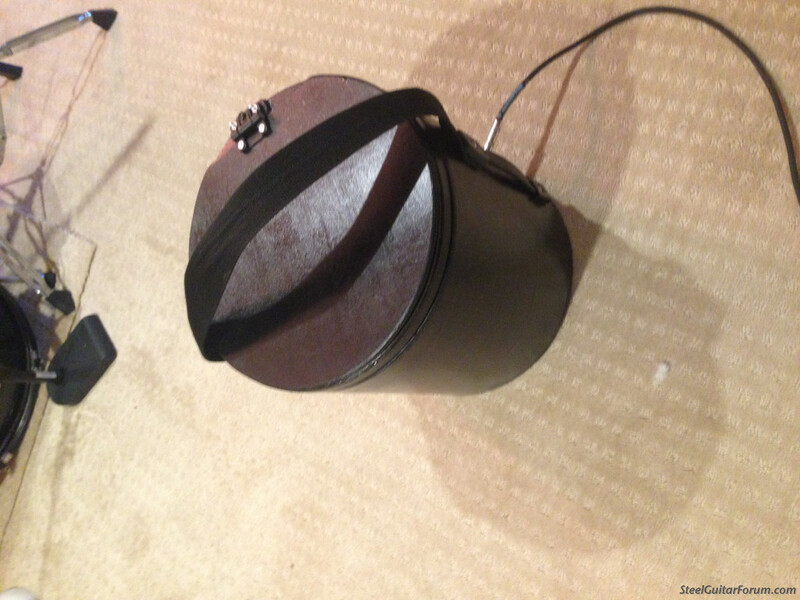 This speaker is just a closed box design and not a transmission line like my article. I used tubes again because they are really light and ultra-rigid because in a cylinder, there are no walls to bow. This is why they make fire hoses round instead of square. Hi George: Yeah it's just a reflector to bounce the sound out rather than let it go straight up. It's just a piece of 3/16" plywood with an adjustable bracket. The bracket is just screwed to the grille and a bit flimsy. I might refine that part of it a bit. You can buy a 4' length of 12" dia. "Sonotube" or "Quickrete" concrete forms at Home Depot for about $12. I used 13" of it. The actual cabinet volume you need will depend on the speaker you use, and how low in bass you want to go. They have a wax coating on the inside, and you have to sand that off wherever you want to try and glue. I also put a reinforcing backing board inside under the handle. 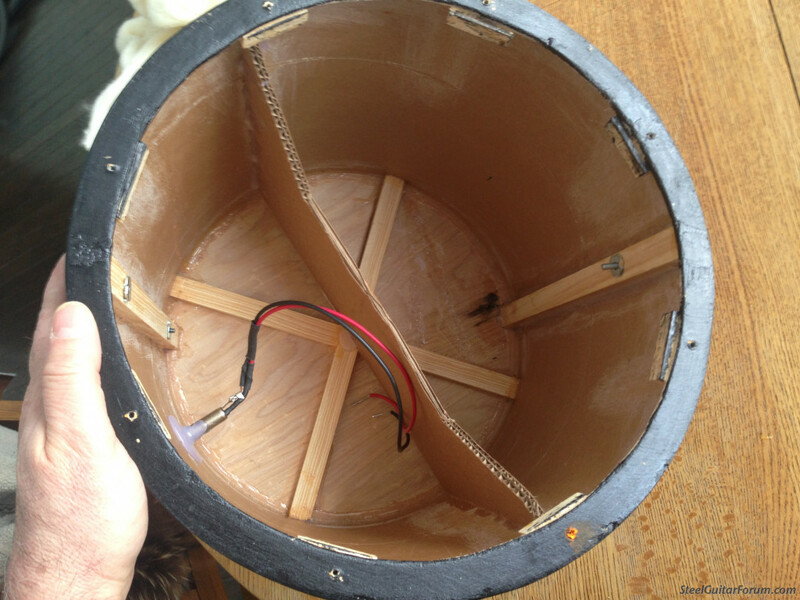 A 3/8 piece of plywood is the bottom, and a ring of it glued to the inside of the top mounts the speaker. Very cool - like an Acoustic Image Upshot. Glenn, I guess you've been doing this a while then! As I am recalling now, the speaker was down firing, but mounted at the top with a flat plate above the magnet to force horizonal dispersion. I wish more of my audience members would say that. Is the end of the tube open or closed? How does it sound when placed in a normal speaker position facing the audience? Have you tried placing it on the floor with a V block to tilt it up? How about turning an amp stand sideways and laying it on that? This would be so simple and cheap to make, it's scary. Spray it with truck bed liner or cover it with tolex, put a round metal grill front on it, and you would have a sharp, contemporary looking cabinet. This design intrigues me. I may make up one. The worst that could happen is I could use it for practice if nothing else. Its closed. You could build this in a bucket if you wanted, but you'd probably have to reinforce the bottom because that's a flat surface. You can set it in the floor without a reflector facing the audience too, but it's a bit beamy. My buddy said it looked like a fan he uses drying out flooded carpets. I took a piece of the extra tube material and a wood square and made a little curved stand so I could angle it up toward me at about 45 degrees. That worked OK, but the stand was another piece to bring to the gig. You could even use tom-tom hardware to angle it if you want. All that mounting stuff though is external to the kernal of the speaker, which is a closed cylinder which is really light because it's cardboard, and super rigid and uncolored because its a cylinder. 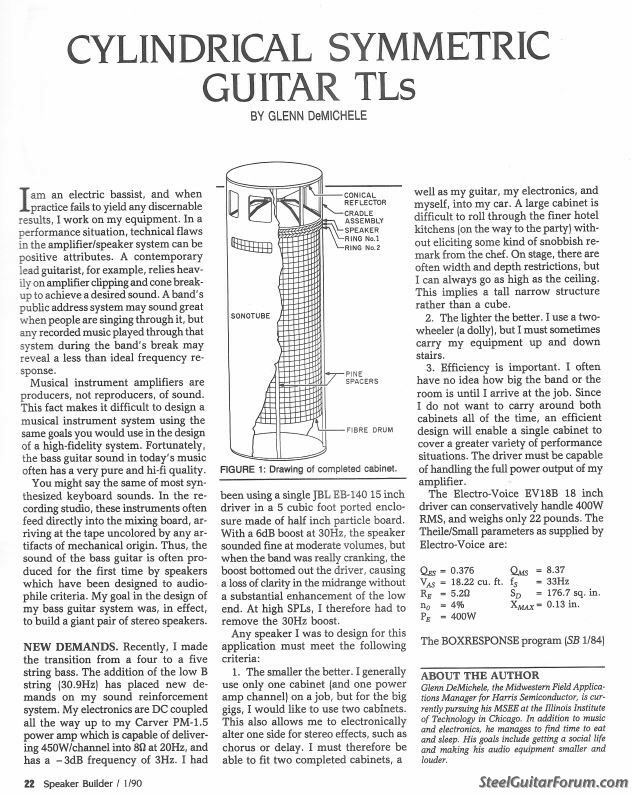 Bill made me nostalgic, and I re-read my bass cabinet article in Speaker Builder magazine from 1990. I was single, playing a lot, had a great-fitting tux, and had no idea that I would someday become obsessed with PSG. Here's a pic of the first page. I'm more than happy to send you a .pdf of the full article if you PM me your email address. I had to laugh when I re-read it. Technology changes! "They had to fit in my car"
"Wrap continuous form computer paper tightly around the tube ... to cut it square" Good luck finding that paper nowadays. 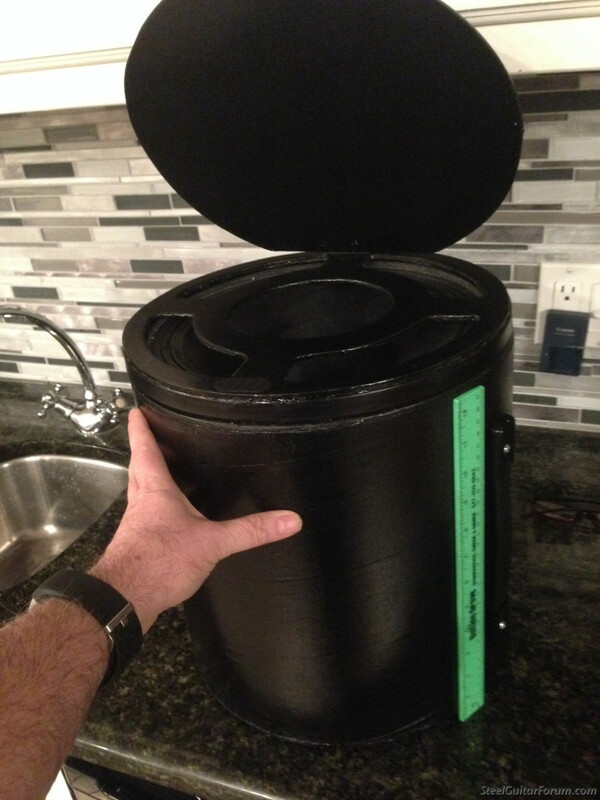 "Look in the Yellow pages for Fibre Drums"
"The completed woofer cabinets weigh only 60 lbs. each"
But, the laws of physics haven't changed, and they were 18" speakers. I ripped out the steel grid, and used the ring with a wood insert I made. I got a "friction hinge" or "position hinge" from Amazon to use instead of the bulky metal lid positioner I was using. It really looks like an "elf toilet" now. Works great though. I used it on bass last night. The TT-12 really got a great fretless sound with my piezo pickup. I will use it in its current form on my first steel gig on Thursday. In my basement, the speaker sounds really omnidirectional and seems to come from everywhere. Glenn thanks so much for sharing this with us. What brand/model speaker did you put in it? 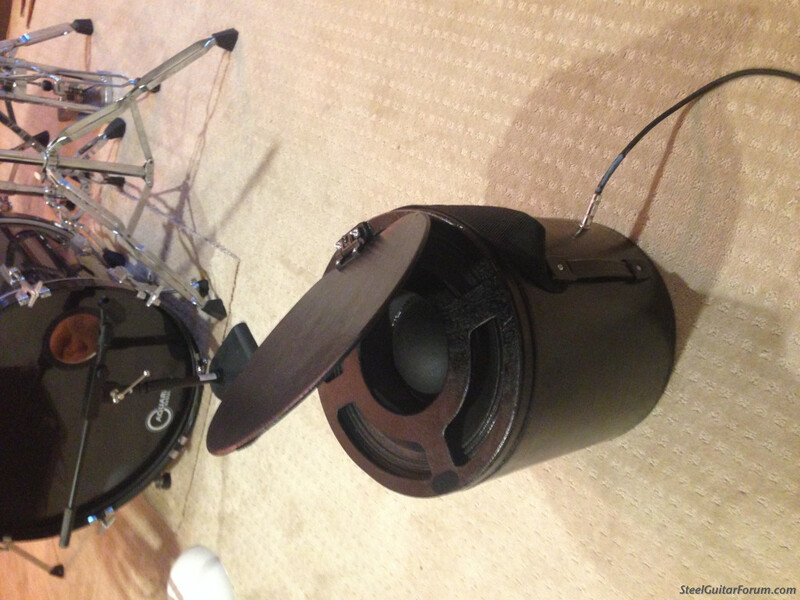 That's got to be the least expensive speaker cab ever. A great example of re-purposing a mass produced commodity item. It's a Travis toy tt-12. I made some revisions, including a friction hinge and Velcro for the top, a sparser grille, and a strap so I can carry it like a bucket. Here's more pics so you can build one. It sounded great on the gig Friday. My sound was everywhere, not just in front of the cab.